Valentine’s fun aside, my kiddos and I have been a little under the weather for the past couple of days. Sore throats, runny noses, not sleeping well…all of which leads to just feeling plain ole exhausted. This is my baby girl’s first time ever being sick, and it makes me so sad to see her feeling all puny, and listening to her little baby snuffles. My son is the same way. Whenever he gets sick, it’s ALWAYS in his chest. He will wake up coughing and crying, and sometimes we just have to spend the night sitting in the bathroom with the hot water turned on while the steam works its magic. After a night like that, we need a little whole food healing power. 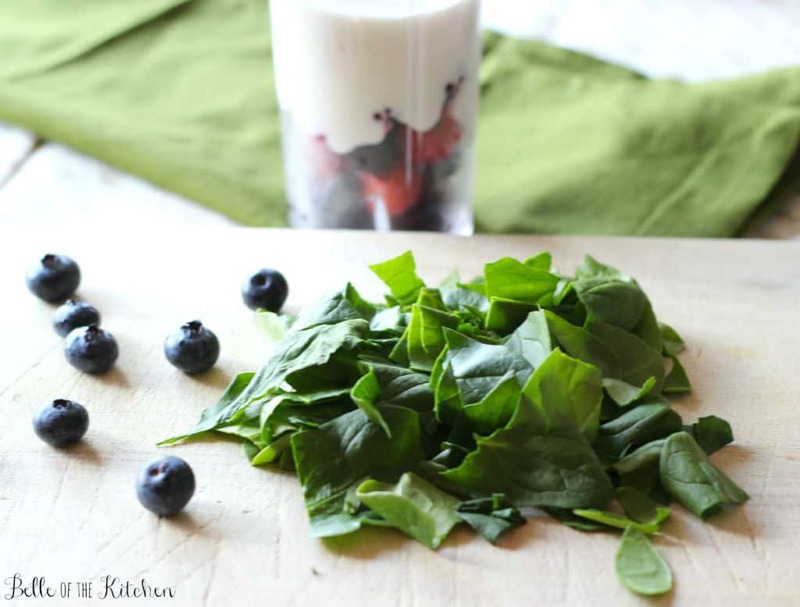 This Berry Spinach Smoothie is the perfect healthy way to start your day! 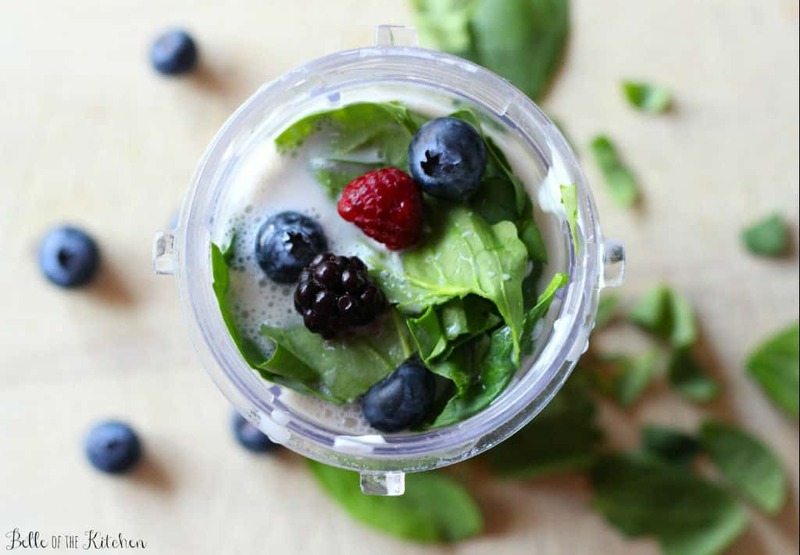 It's full of vitamins and antioxidants and tastes amazing, too! Yummy! Simple ingredients and fast to make! Love it! And who doesn’t love smoothies?! 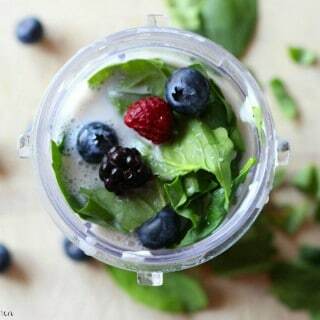 This is perfect for healthy January after all the binge eating over the holidays 🙂 I love berry smoothies and spinach will be a perfect addition to them. Smoothies are a wonderful hangover cure too 😉 This sounds lovely. This looks delicious and healthy. Love the make to this amazing recipe. Thanks for sharing this recipe! It looks and sounds delicious. I love that you have included chia seeds…something I’ve never thought about adding to a smoothie. Hi Valerie! 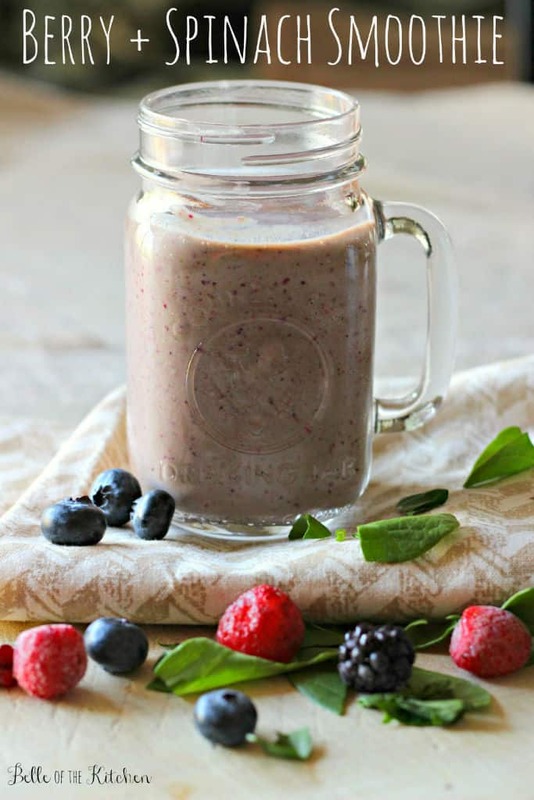 I love chia seeds, and they are great in smoothies! They don’t alter the flavor at all and just bump up the nutrition. 🙂 Thank you so much for visiting! Thank you for linking on Show Me Your Plaid Monday’s!! You are one of this weeks features! Found you through the Fantastic Friday Blog Hop. This looks so yummy! I must try it. New follower on Blog Lovin and Facebook! Thanks for sharing at My Favorite Things Party. Super healthy & yummy looking. Theresa co host. Drop by anytime and hope to see you again this week. This looks healthy and delicious! Great way to get some extra veggies in our families diet. It is so hard with a meat loving man and 5 year old so I am always looking for good ideas. It’s such a good idea to have a spinach smoothie to help during sickness. I had to laugh at your son eating all the blueberries while you messed with the camera–I could totally see that happening in my house! Thanks so much for sharing this at Frugal Crafty Home Blog hop! Oh yeah, I have to watch that little guy. He is like a bottomless pit and will eat me out of house and home if I don’t keep a close eye on him! Thanks for coming by, Carrie! Ooooh, cocoa sounds good to me!! Let me know how it turns out, girl! Thanks so much, girl! They’re much better now, but it’s no fun for anybody when the babes are sick. Thank you, Carolyn! I’ll definitely drop by! Yum! This looks so good. I love a leafy green smoothie. Found this on the Show Me Your Plaid link up! This is one of my favorite smoothies. Beautiful photos! You are so right about smoothies Ashlyn! Seems like so many people are under the weather. I guess it’s typical for this time of year. I hope by now your babies are on the mend (and you too!). Just found your bloglovin profile through the fantastic fridays linkup- can’t wait to try your recipes! !